Owing to Switzerland's political structure as a confederation of – in many respects – sovereign states (cantons), the competence to investigate and prosecute criminal conduct in general, including unlawful corporate conduct, may lie with cantonal or with federal authorities, depending on the specific circumstances of the case. The authority generally competent at the federal level to investigate and prosecute criminal conduct is the Office of the Attorney General. Matters in the field of economic crime are being handled by a dedicated division. Likewise, cantons with major financial centres, such as Basle, Ticino, Geneva and Zurich, have special units in charge of investigating and prosecuting economic crime. The powers of investigation by prosecutors at both federal and cantonal levels are defined by federal law, namely the CPC. They comprise the range of compulsory measures typically available to public prosecutors to secure evidence, ensure that persons attend the proceedings and guarantee execution of the final judgment,9 in particular summons, tracing of persons and property, remand and preventive detention, searches of records, persons and premises (including dawn raids), seizure and confiscation, DNA analysis and covert surveillance (including surveillance of post and telecommunications, monitoring bank transactions and undercover investigations). Investigations of suspected violations of regulatory laws are often assigned to independent examiners (typically a law firm or an audit firm with expertise in the field at issue); however, these examiners act under the auspices of FINMA. While neither the examiners nor FINMA agents have the power to carry out dawn raids or to search the premises of a financial institution, the law directs the parties subject to an investigation to fully cooperate with FINMA, to allow examiners access to premises and to provide them with all the information and documents that they may require to fulfil their tasks.13 Thus, in practice, examiners and investigating agents of FINMA have extensive investigative powers. At the initial stage of regulatory intervention, it is not uncommon that FINMA will order an institution to conduct an internal investigation (mostly assisted by external legal and forensic experts) and to furnish a written report on the findings so as to enable FINMA to make an early assessment of the matter prior to assigning its own resources to the case. What is more, in the context of criminal investigations in a corporate context, the nemo tenetur principle is subject to important limitations. Swiss criminal law is characterised by the premise that an enterprise, subject to certain exceptions, cannot be held criminally liable.23 The investigation and prosecution of unlawful conduct is thus often directed against employees only, so that the enterprise, not being in a position to make use of the defence rights of an accused party, cannot refuse to cooperate with the prosecuting authorities. Where undertakings are subject themselves to criminal liability,24 they enjoy the same procedural guarantees as Swiss law would grant to any individual. Since the procedural rules make a distinction between the accused enterprise and those directors, officers and employees who can be called upon by the prosecuting authorities as information persons or witnesses, the options for enterprises to prevent disclosure of internal matters is nevertheless limited. Also, cooperation may be condoned by mitigating sanctions or by not sanctioning the undertaking at all.25 Last but not least, refusing to cooperate is rarely beneficial: a protracted investigation persistently absorbs management capacity, often disrupts business relationships, erodes reputation and creates legal and financial uncertainties. As mentioned in Section I, Swiss law recognises the nemo tenetur principle. This rule also applies to legal entities. For undertakings active in the field of financial intermediation26 and legal entities that trade in goods commercially and accept cash in so doing, Swiss anti-money laundering legislation provides for an important exception: they must report suspected money laundering, or connections to terrorist financing or criminal organisations to the Money Laundering Reporting Office of Switzerland.27 This reporting duty also exists in cases where the undertaking itself is involved in the money laundering transaction. Non-compliance may entail a fine and, more importantly, regulatory sanctions. Within the ambit of administrative (regulatory) law, the Financial Market Supervision Act (FINMASA) requires supervised persons and entities and their auditors to immediately report to FINMA any incident that is of substantial importance to the supervision.28 The incidents referred to by the FINMASA comprise significant cases of unlawful conduct, including criminal acts such as the embezzlement of clients' assets, disloyalty, criminal mismanagement, money laundering or large-scale tax offences. The need to tackle suspected or actual irregularities by way of an internal investigation typically originates from diligence duties imposed by civil and administrative (regulatory) law. As already noted, undertakings subject to supervision by FINMA are obliged to report incidents that are material from a regulatory perspective. If a matter that comes to the attention of a supervised undertaking potentially meets that criterion, the undertaking will have to clarify the pertinent facts and assess them in respect of the need to take action, including, besides reporting to FINMA, possible measures to restore compliance. At the civil law level, an internal investigation may become imperative for board members and senior managers of an undertaking in order to fulfil their duty to ascertain compliance with applicable governance standards. The Swiss Code of Obligations31 provides that members of the board and others engaged in managing an entity's business must perform their duties with all due diligence and safeguard the interests of the undertaking in good faith.32 Hence, indications of material misconduct must lead them to initiate an internal investigation. As a result of their general obligation of loyalty to their employers,36 employees must cooperate in an internal investigation, inter alia, by undergoing interrogation, unless they would thus incriminate or expose themselves to civil (or criminal) liability. To enable employees to adequately exercise their rights and – not least – to create an atmosphere of mutual confidence promoting their willingness to cooperate, undertakings should, and in practice regularly do, encourage employees to retain independent counsel. Related costs are typically covered by the employer. Confidentiality is a key requirement in not prematurely narrowing down the number of options for an adequate response to the findings that may result from an internal investigation. This applies even in cases where the undertaking may ultimately have to share its findings with the (regulatory) authorities or proceed to voluntary self-reporting. To ensure confidentiality, undertakings regularly retain law firms to lead internal investigations.37 Provided that the investigation is a task embedded in the law firm's advisory or legal representation mandate, attorney–client privilege protects communications between the law firm and the undertaking, and between the law firm and its agents (namely accounting and forensic firms instructed by the law firm to perform certain tasks under its auspices), and documents such as minutes of interviews conducted by the law firm, meeting notes and reports. Recent Swiss case law underlines the importance of placing an internal investigation into the wider context of specific attorney work if confidentiality is of concern.38 Business undertakings cannot simply 'outsource' investigations and the keeping of records of an investigation's results to law firms in order to preserve privilege. Attorney–client privilege applies comprehensively only when the collation of facts, their interpretation and legal analysis are inseparable elements of one and the same comprehensive (advisory or defence) mandate. In the private sector there is no specific law on whistle-blowing. An attempt by Parliament to introduce provisions to existing legislation failed in 2015. Hence, the general rules and principles of employment law, company law, criminal law and data protection law apply. An employee must raise suspected or known irregularities with his or her employer according to applicable internal rules (if any) prior to releasing any information to external entities; otherwise the employee may be in breach of contractual loyalty and confidentiality obligations towards the employer. If the disclosure is made intentionally, criminal liability may ensue in addition to the liability for breach of contract. Swiss law does not require undertakings to set up a specific internal whistle-blowing unit to which employees may report confidentially, although, in line with international guidelines and best practices, many corporations have introduced a mechanism or designated an independent body to which suspected misconduct can be reported. Studies show that 11 per cent of all companies in Switzerland have introduced a reporting point.39 Considerable differences exist between large international corporations where the majority of the designated internal or external reporting points are to be found (70 per cent) and smaller to medium-sized enterprises where such reporting points are still rare (less than 10 per cent). The case law of the Federal Supreme Court provides additional guidance, in particular with respect to the requirements that employees must meet before reporting to the public.40 First, employees are bound not to disclose to the public any information concerning their employer and its business that is not in the public domain. Generally, employees must remain silent even about offences committed within the employer's domain unless there is a public interest in the disclosure that overrides the employer's interest in keeping unlawful conduct confidential. The proportionality test requires that an employee informs the employer before notifying the authorities and, further, that employees may report to the public only if the notified authorities fail to take action. While the enactment of whistle-blower legislation in Switzerland is stalled, guidelines and recommendations for compliance and best practices shape the reality. Swiss companies are well advised to establish reporting systems, endorse company policies for transparency and to draft rule books and guidelines for their employees. The law on corporate criminal liability thus sanctions organisational deficiencies rather than the criminal conduct (for which the individual perpetrator remains responsible), thereby creating a strong incentive for undertakings to establish sound compliance and government standards. In the area of competition law, the existence of compliance programmes to prevent contraventions of the CartA may provide a decisive argument to shield members of the governing bodies of an undertaking involved in unlawful conduct from personal criminal liability under Articles 54 and 55 CartA. As noted above, criminal law primarily addresses the conduct of individual perpetrators. Liability of undertakings is basically of an accessory nature only. Accordingly, criminal prosecution inevitably means prosecution of individuals, also in a corporate crime context. Ideally, the undertaking therefore limits interaction with the targeted employee to obtaining information from him or her (or the employee's counsel), whereas it cannot keep the employee apprised of its own strategies, actions and communications with the authorities. During an investigation, an employee's contract should not be terminated. For as long as the employment relationship continues, the undertaking has a handle on the employee to assert compliance with directives and instructions and loyal safeguarding of the undertaking's interests,68 which may include cooperation in fact finding and reporting on developments of concern to the employer. While the undertaking may consider releasing the employee from his or her work pending the investigation (garden leave) for reputational reasons, or to avoid undue interference, it should not take disciplinary measures prior to completion of the investigation. Also, when considering any disciplinary measures, the undertaking must apply principles of fair process; the safeguarding of an employee's personal rights (including the right to be heard) is mandatory.69 Regularly, undertakings concerned about criminal or administrative proceedings arrange for independent legal counsel to support the employee under investigation and sustain the resulting cost. As a rule, legal fees are paid by the employee only if he or she acted manifestly against internal regulations, instructions or statutory law. In the public law domain, it is the Act against Unfair Competition,71 the CartA, the Data Protection Act and the Public Procurement Act72 that have extraterritorial reach. The competition law, for example, applies in all matters that have an unfair impact on the Swiss market irrespective of whether the infringing conduct took place within or outside Switzerland (effects doctrine).73 Similarly, competition law offences that have an effect in Switzerland can be investigated and sanctioned by COMCO even if they took place abroad. Criminal law follows the principle of territoriality, but extends its reach with respect to certain offences. In combating corruption in the private sector, Parliament recently introduced Articles 322 octies and 322 novies CC, which declare it punishable for anyone to offer or request undue advantages in exchange for carrying out or omitting an act in connection with the function in a company or organisation in the private sector, be it in contravention of duties or in the exercise of discretion. Active bribery in the private sector does not only expose the individuals committing the act to prosecution, but by virtue of Article 102, Paragraph 2 CC may also trigger the liability of the undertaking. This provision can lead to extraterritorial jurisdiction over non-domestic branch offices of Swiss undertakings. Parliament is scheduled to debate a controversial initiative seeking to extend liability of Swiss undertakings to the conduct of entities abroad that are controlled by them, and to introduce mandatory governance standards based on the United Nations Guiding Principles on Business and Human Rights.74 Should the proposed regulation become law, governance breaches by Swiss undertakings abroad would generally come within the reach of Swiss courts. Switzerland cooperates with other countries' government agencies, judiciary or prosecution authorities by way of administrative assistance or judicial assistance.75 The distinction of these two routes of cooperation is important. In a recent judgment, the Federal Supreme Court underlined that administrative assistance is limited to cooperation between administrative bodies and for administrative purposes (for example, the enforcement of tax laws) only, whereas information required for the purposes of criminal prosecution must be sought by way of judicial assistance in criminal matters.76 There is no bypassing of the rules – and specific procedural guarantees – of judicial assistance by the route of administrative assistance. FINMA cooperates with foreign supervisory authorities in specific supervisory or enforcement proceedings. The latest statistics (published in 2015)79 show a steady increase in the number of requests for international cooperation pertaining mostly to offences of insider trading, market manipulation and breach of reporting duties. There are certain criminal provisions that need to be considered in an investigation abroad having a nexus to Switzerland. The first is the prohibition to carry out activities on behalf of a foreign state on Swiss territory without official approval, where the activities are the responsibility of a public authority or an official pursuant to Article 271 CC. The criminal sanction may also apply to foreign attorneys travelling to Switzerland for the purpose of an investigation81 and it may even cover the remote accessing of information via a Swiss-based server. The second is the ban on divulging Swiss business secrets to foreign entities and states pursuant to Article 273 CC. A 'Swiss business secret' is any information of commercial value that is not in the public domain outside Switzerland and that typically relates to a business domiciled in Switzerland.82 It applies also to the intra-group and cross-border disclosure of business secrets from a subsidiary to the parent company. Even the inadvertent cross-border disclosure of facts may constitute a violation of Swiss business secrecy. Further, Article 47 of the Banking Act sanctions the duty on banks to keep private information about their clients confidential (often referred to as bank secrecy). The purpose of the provision is to safeguard the privacy of the client; it is not a confidentiality privilege of the bank. Article 162 CC makes it an offence to reveal a business secret that has to be guarded pursuant to a statutory or contractual obligation. The world of soccer kept the Office of the Attorney General (OAG) busy throughout 2017. On 20 March 2017, the federal prosecuting authority opened a new file against a former secretary general of FIFA and others for alleged bribery, fraud and criminal mismanagement in connection with the assignment of broadcasting rights for the 2018, 2022, 2026 and 2030 World Cup tournaments. In June 2017, the OAG completed a first proceeding in the context of the FIFA investigations by way of a summary penalty order. The accused, a former employee of a Swiss bank, was found guilty of forgery of documents pursuant to Article 251 CC and contravention of diligence duties under the AMLA. The case is remarkable as it was handled in close coordination with the United State Attorney's Office for the Eastern District of New York, in terms of both timing and sanctioning. The counts to which the accused had pleaded guilty in the US proceedings were no longer prosecuted in Switzerland in order to avoid double-jeopardy issues. In March 2017, the OAG closed a noteworthy case of self-reporting in a corruption matter. In 2015, the accused undertaking reported suspected bribe payments to Nigerian officials. When assessing the case, the OAG gave particular consideration to elements such as self-reporting, active cooperation from the outset, comprehensive support of the investigation and implementing concrete measures to remedy organisational deficits. The company was eventually sentenced to a symbolic fine of 1 Swiss franc and disgorgement of unlawful profits in the amount of 35 million Swiss francs. In the area of financial market law enforcement, FINMA has continued its efforts to deter money laundering by focusing on compliance with diligence duties. In line with the enforcement strategy as published in October 2014, individuals responsible for breaches stayed in the focus of regulatory action – indeed, the number of sanctions imposed on individuals roughly doubled the number of orders made against undertakings in the segment of unauthorised banking and security trading activities. As in 2016, suspected and actual involvement of Swiss financial institutions in global corruption and money laundering scandals surrounding 1MBD, FIFA and Petrobras were another focal point of FINMA investigations. A notable case completed in January 2017 concerned a bank that accepted transfers between 2006 and 2015 from the entourage of 1MBD totalling US$2.4 billion, thereby ignoring a series of indicia of money laundering. Besides a declaratory ruling blaming the bank for the misconduct, FINMA confiscated illicit profits in the amount of 6.5 million Swiss francs. Other significant areas of regulatory action were the fight against insider trading and market manipulation, and the prevention of unauthorised business activities that are reserved for licensed banks and security traders. Last but not least, in September 2017, FINMA ordered for the first time the liquidation of a cryptocurrency undertaking. The coin offering was found to qualify as a disguised taking of deposits from the public, which required a banking licence. Moreover, the currency was not immune to price manipulation. While the focus of investigations by COMCO in 2017 remained on hard cartels, such as agreements to fix prices, agreements to limit the quantities of goods or services to be produced, purchased or supplied or agreements to allocate markets, the most significant case concerned the abuse of a dominant position in the market. Swiss Post, the state-owned provider of postal services, was charged in December 2017 a penalty of 22.6 million Swiss francs for having discriminated against clients by applying different price models and for having obstructed competitors. Attorney–client privilege in connection with internal investigations: case law appears to be in flux as regards the prerequisites for, and scope of, protection of attorney work products in internal investigations. Protection of whistle-blowers: as already discussed in Section II.iii, a legislative project by the government was rejected in Parliament in 2015. Swiss law thus still fails to provide specific guidance for undertakings and individuals concerned. 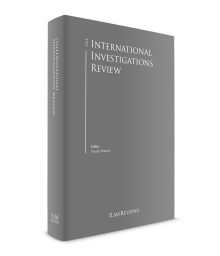 Multi-jurisdiction investigations: the legal corset of domestic and international laws on administrative and judicial cooperation is often perceived by investigating authorities and – in some instances also by undertakings and individuals investigated – as not flexible enough to sensibly respond to the challenges of multi-jurisdiction investigations; cooperation is thus often informal. Also, there continues to be a high degree of uncertainty as regards protection of basic civil rights in matters that are being investigated in parallel in various jurisdictions, such as nemo tenetur and ne bis in idem. Protection of supervisory privilege: Swiss courts, including the Federal Supreme Court, have in the past repeatedly confirmed the prosecutors' authority to compel undertakings and individuals in criminal investigations to disclose documents (including internal investigation reports) that had been prepared for regulatory purposes even where the competent regulatory agency expressly declined to share such documents with the prosecuting authorities. What remains clear, however, is the need for constant review and improvement of compliance structures to keep pace with national and international developments. Adequate organisation and, no less importantly, a culture promoting compliance, are the most efficient ways to minimise exposure to criminal or regulatory scrutiny in general and the uncertainties outlined in this chapter in particular. 1 Bernhard Lötscher is a partner and Aline Wey Speirs is a counsel at CMS von Erlach Poncet Ltd.
2 Swiss Criminal Procedure Code (CPC, SR 312.1). 3 See: Article 22 CPC. The provision roots in Article 123, Paragraph 2 of the Swiss Constitution, which directs that the cantons are responsible for the organisation of the courts, the administration of justice in criminal cases as well as for the execution of penalties and measures, unless the law provides otherwise. 4 E.g., members of the federal government, the federal parliament or the Federal Supreme Court. 5 E.g., offences involving the use of explosives, toxic gas or radioactive substances. 8 Articles 154 to 156 of the Financial Market Infrastructure Act (SR 958.1). 10 The scope of regulatory jurisdiction and the powers of FINMA are specified in the Financial Market Supervision Act (FINMASA, SR 956.1). 11 Federal Act on Combating Money Laundering and Terrorist Financing (SR 955.0). 12 Federal Act on Banks and Saving Banks (SR 952.0). 13 Articles 29 and 36 FINMASA. 14 Article 38, Paragraphs 1 and 2 FINMASA. 15 Swiss Criminal Code (CC, SR 311.0). 16 Article 38, Paragraph 3 FINMASA. Violations of the criminal provisions of the financial market acts are generally prosecuted by the Federal Department of Finance or, in cases where a matter may be subject to a custodial sentence, by federal or cantonal prosecutors; cf. Article 50 FINMASA. 17 See: Articles 31 et seq. FINMASA. 18 Federal Act on Cartels and Other Restraints of Competition (SR 251). 19 See, in particular, Articles 40 and 42 of the Cartel Act (CartA). 20 See Article 14, Paragraph 3(g) of the International Covenant on Civil and Political Rights and Article 6 of the European Convention of Human Rights. 21 Article 113, Paragraph 1 CPC. 22 In conjunction with FINMA and Competition Commission (COMCO) investigations, the targeted party is subject to a comprehensive duty to cooperate (Articles 29 and 36 FINMASA and Article 40 CartA). 23 The principle known as societas non delinquere potest was abolished in Swiss criminal law only on 1 October 2003, when Article 102 CC on corporate criminal liability entered into force. 24 Pursuant to Article 102, Paragraph 2 CC, undertakings may be held criminally liable for participation in a criminal organisation (Article 260 ter CC), financing of terrorism (Article 260 quinquies CC), money laundering (Article 305 bis CC) and bribery (Articles 322 ter, 322 quinquies, 322 septies, Paragraph 1 or 322 octies CC). 25 Articles 74 et seq. CC. 26 Financial intermediaries include banks, investment companies, insurance companies, securities traders, central counterparties and securities depositories, providers of payment services, casinos and asset managers. 27 Article 9 of the Anti-Money Laundering Act. The Money Laundering Reporting Office of Switzerland is a member of the Egmont Group, which is an international association of financial intelligence units, whose objective is to foster a secure, prompt and legally admissible exchange of information to combat money laundering and terrorist financing. 28 Article 29, Paragraph 2 FINMASA. 29 Article 49a, Paragraph 2 CartA. 30 See: Ordinance on Sanctions Imposed for Unlawful Restraints of Competition (Cartel Act Sanctions Ordinance, SR 251.5). 31 Federal Act on the Amendment of the Swiss Civil Code, Part Five: Code of Obligations (CO, SR 220). 32 See: Article 717 CO.
33 Articles 328 and 328b CO.
35 Articles 12 et seq. FADP. 36 Article 321a, Paragraph 1 CO.
37 Swiss law does not recognise a legal privilege of in-house counsels and legal advisers who are not members of the Bar Association, even if the work they perform may qualify as legal advice. 38 Federal Supreme Court, judgment of 20 September 2016, 1B_85/2016; Federal Criminal Court, judgment of 4 September 2017, BE.2017.2. 39 See: HTW Chur, 'Whistleblowing Report 2018', https://whistleblowingreport.ch. 40 See: DFT 127 III 310, 30 March 2011, consid. 5. 41 Article 22a Federal Act on Personnel (BPG, SR 172.220.1). 44 From around 70 reports in previous years to 122 reports in 2017. 47 See: International Principles for Whistle-blower Legislation published by Transparency International in 2013; https://transparency.ch/wp-content/uploads/2017/08/2013_WhistleblowerPrinciples_EN.pdf. 48 Article 102, Paragraph 1 CC. 49 Article 102, Paragraph 2 CC. 50 Article 55, Paragraph 2 Civil Code. 51 Article 55, Paragraph 1 CO.
54 Articles 70 et seq. CC. 55 Articles 31 et seq. FINMASA. 56 Articles 44 et seq. FINMASA. 57 Articles 49 and 50 CartA. 60 Articles 54 et seq. CartA. 61 Article ۱۰۲, Paragraph ۲ CC. 62 See: FINMA Circular 2017/1 'Corporate governance – banks', note 6. 63 See also: OECD (2014), Risk Management and Corporate Governance, Corporate Governance, OECD Publishing, http://dx.doi.org/10.1787/9789264208636-en. 64 FINMA guidelines on enforcement policy of 25 September 2014. 65 See: 'FINMA enforcement report 2017' of 27 March 2018. 68 Articles 321a and 321d CO.
69 See: Article 328, Paragraph 1 CO.
70 See: Report of the Swiss Centre of Expertise in Human Rights, 'Extraterritorialität im Bereich Wirtschaft und Menschenrechte', 15 August 2016, www.skmr.ch/cms/upload/pdf/160815_SKMR_Studie_Extraterritorialitaet.pdf. 71 Federal Act Against Unfair Competition (UCA, SR 241). 72 Federal Act on Public Procurement (SR 172.056.1). 73 Articles 3 and 7 UCA. 74 The initiative is known as 'Konzernverantwortungsinitiative'; see: http://konzern-initiative.ch. 75 The Swiss government maintains a comprehensive database on the sources of law and forms relevant in international legal assistance, https://www.rhf.admin.ch/rhf/de/home/rechtshilfefuehrer/laenderindex. 76 Federal Supreme Court judgment dated 28 December 2017, 2C_640/2016. 77 Federal Act on International Mutual Assistance in Criminal Matters (SR 351.1). 78 Article 32 of the International Mutual Legal Assistance Act. 81 Spehl/Gruetzner (eds. ), Corporate Internal Investigations, CH Beck oHG, Munich 2013, Germany, p. 360 n 25. 82 Ibid., p. 361 n 29. 83 Article 13 Federal Act on Free Movement of Attorneys (BGFA, SR 935.61). 84 Article 321 CC: the person violating the professional secret may, upon complaint, be liable to a custodial sentence of up to three years or to a monetary penalty. 85 Whether and to what extent foreign lawyers can invoke legal advice or representation privilege widely depends on the rules applying in their own jurisdiction. Switzerland tends to recognise the core elements of foreign privilege rules.